Hi Friends: It's time for a new challenge over at the SheepSki Designs Challenges Blog! The theme for this month is Feature a Creature. Here's my project for this month's challenge - I used this awesome digital stamp called Duplicity from SheepSki Designs. As soon as I saw this image, I knew I wanted to do a mixed media tag with it. 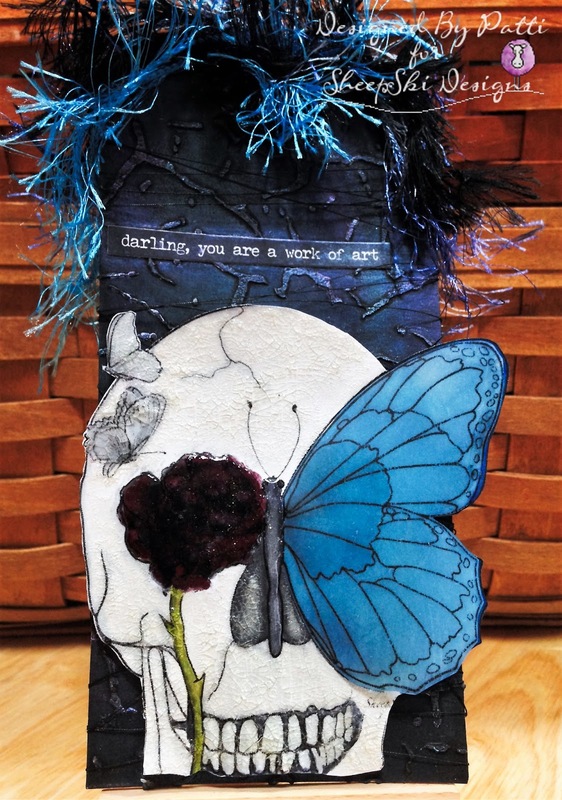 I used lots of fun products, including Prima waxes, crackle paint, and embossing pastes to add lots of color and texture. So much fun! Print image onto smooth white cardstock and color with Spectrum Noir markers, then fussy cut the image. Print duplicate image onto vellum, fussy cut the large butterfly, and color the back / non-printed side with Spectrum Noir markers, then use alcohol sanitizer gel to smudge the color around. Add clear crackle paint to the skull image - exclude the rose and large butterfly. Once dry, add Glossy Accents to the rose and butterfly body, then sprinkle fine glitter into the wet Glossy Accents on the rose. Use clear foam squares to add the butterfly wing to the skull. Use embossing paste with the Crackle stencil to add texture to the tag, then cover it with black gesso. Once dry, color the tag with Prima Waxes. Add sentiment, then color with the same Prima waxes. Wrap black thread around the tag, then adhere the skull using a piece of recycled cardboard to add dimension. Finish with some matching fibers through the top of the tag.